You can listen here (1 hr). He thought he was interviewing me for his podcast, but really I was interviewing him for our blog;) The session was an episode of Michael's podcast Forecast, which he produces to cover climate science. Michael has been a regular attendee at our climate economics lunch and it's been helpful to get his take on the recent developments in our field. Are the curious trends in despair and diets related? 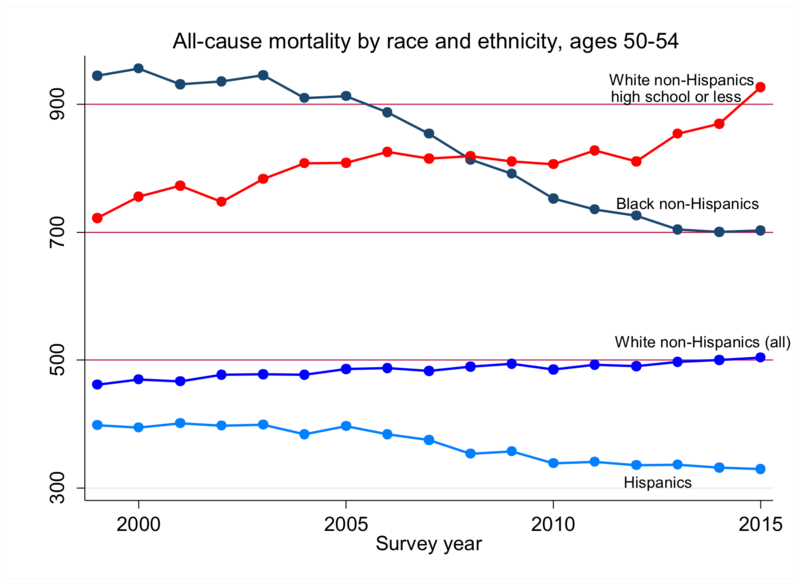 There’s a new working paper out by Anne Case and Angus Deaton on one of the most curious (and saddest) trends in America – mortality rates for whites have been rising. There have been various stories about these trends, such as this one that first turned me onto it. 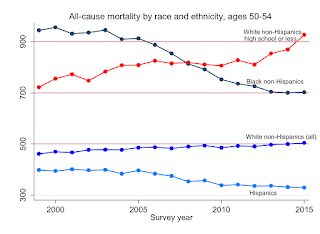 It’s clear that the proximate causes are an increase in “deaths of despair,” namely suicides, drugs, and alcohol. It’s also clear that self-reported mental health has been declining in this group. But why? One explanation that seems to have gained most traction is that whites “lost the narrative of their lives.” That is, maybe rising economic inequality and other economic trends have affected all groups, but whites expected more. To me this seems plausible but not really convincing. Ok, so let me offer another theory. I’ll first say that I think it’s a bit off the wall, but I don’t think I’m going crazy (despite Marshall’s frequent hinting that I am). The idea basically stems from another body of literature that I’ve recently been exploring, mainly because I was interested in allergies. Yeah, allergies. Specifically, a bunch of people I know have sworn that their allergies were fixed by eliminating certain foods, and given that some people in my family have bad seasonal allergies, I decided to look into it. It turns out that wheat is thought by many to trigger inflammation and allergies. But what’s relevant here is that it’s also thought to affect mental health. More than that, there are actually clinical studies like this one showing that depression increases with gluten intake. There are only 22 subjects in that study, which seems low to me but obviously I don’t do that sort of work. A good summary of scientific and plenty of non-scientific views on the topic can be found in this article. Incredibly, there was even a study in the 1960s showing how hospital admission rates for schizophrenia varied up and down with gluten grain rations during World War 2. So what’s the connection to the trends in deaths of despair? 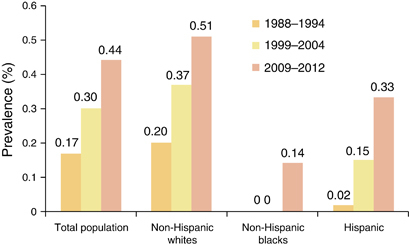 Well the striking thing to me is that wheat effects are generally only seen in white non-hispanics. Celiac disease, for instance, is much lower in other racial groups. Second, it’s apparently known that celiac has been rising over time, which is thought to indicate increased exposure (of all people) to gluten early in life. And the trends are most apparent in whites, such as seen in the figure below from this paper. Just to be clear, I realize this is mostly speculation. Not only is this not my area of expertise, but I don’t have any data on the regional trends in gluten or wheat intake in the U.S. to compare to the regional trends in death. 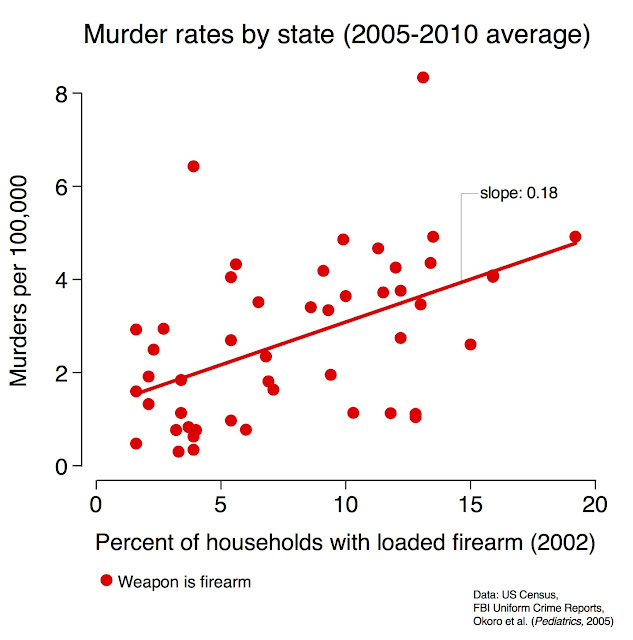 I’m not even sure that such data exist. It seems that studies like this one looking at trends in gluten consumption just assume the gluten content of foods is fixed, but it also seems a lot of products now have gluten added to make them rise quicker and better. (Some blame the obsession with whole grain foods, which don't rise as quickly.) If anyone knows of good data on trends in consumption, let me know. 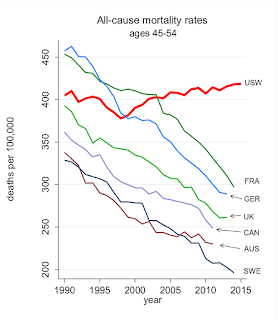 It would also be interesting to know if they add less gluten in other countries, where mortality rates haven’t risen. Also to be clear, I still like wheat. Maybe having spent most of my career studying wheat producing systems has made me sympathetic. Or maybe it’s the fact that it has sustained civilization since the dawn of agriculture. But I think it’s possible that we recently have gone overboard in how much is eaten or, more specifically, in how much gluten is added to processed food in this country. 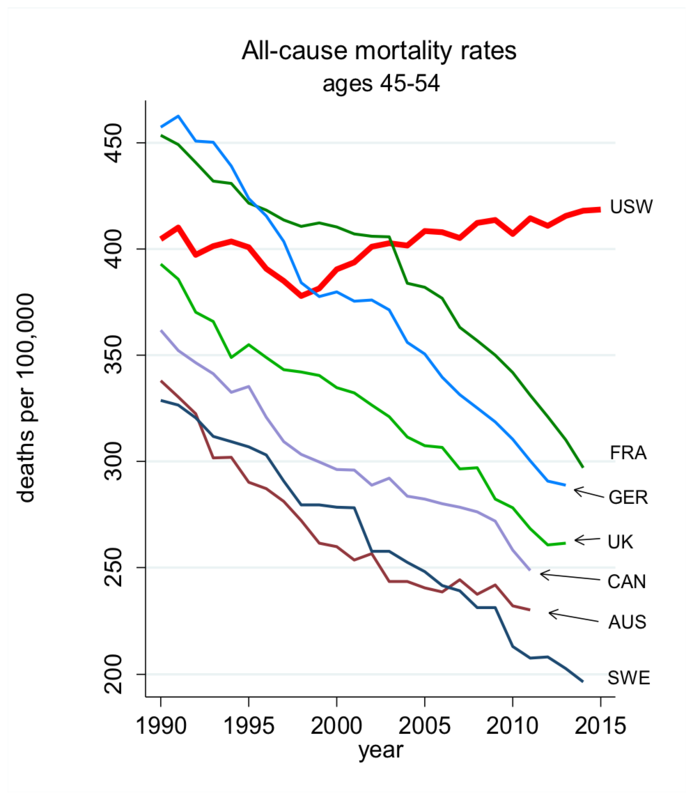 And even if there’s only a small chance it’s partly behind the trends of despair (which aren’t just causing mortality, but all sorts of other damage), it’s worth looking into.